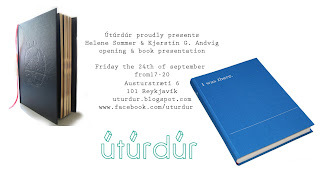 Útúrdúr proudly presents Helene Sommer and Kjersti G. Andvig. Friday the 24th of september from 17-20 they will have a book presentation and open a exhibition in Útúrdúr. Everybody is welcome. The book project I was (t)here., published in 2009, is a collection of stories compiled over a few years from a range of sources. Both texts and images, all so-called nonfiction and second or third hand information, are re-narrated, frequently taken out of context, highlighted or twisted according to memory and perception; sharing the common denominator of reflecting dysfunctional and problematic systems whether in relation to history, science, memory or information . In addition to the book the video-montage “Variations of Max” (2010, 23min) will be presented at Útúrdúr. Helene Sommer (b. Oslo, 1978) graduated from The National Academy of Fine Arts (Oslo) in 2003 and currently lives and works in Berlin. The book I was (t)here. has recently been presented in exhibitions such as IN-book OUT-book IF book at Municipal Library in Palazzo Mauri (Spoleto, Italy), Labyrint, Botkyrkan Konsthall (Stockholm), Working Title, CCA Udojewski Castle (Warsaw). The book 'Personne Ici nes't Innocent', published in 2008, was made as a result of a 2-year long project about the historical relationships between knitting, capital punishment and the development of democracy. The project in it’s whole resulted in a collaboration with Carlton A. Turner, who resided on Death Row in Texas for 10 years. Together we knitted a 3 dimensional replica of his prison cell. The work was recently shown at Listasafn Islands, the National Gallery of Iceland. The book is a combination of documentation of the works the project accumulated, as well as the research material who inspired them. At Útúrdúr the book will be accompanied together with the knitted banner ‘Coupez Leur la Tetê’. Kjersti G. Andvig is born 1978 and is educated at the National art academy in Oslo. At present she is living and working in Berlin and Oslo.